Sorry about the delay in posting recently - it has been a whirlwind of activities with work and school for me and the family. All in all, God is good and He has been faithful. 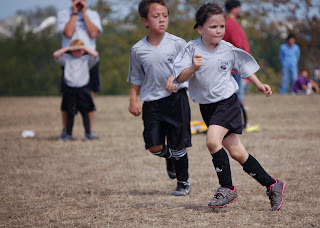 Here is a picture of Anna playing soccer. There is something absolutely wonderful about going to John and Anna's games. It is really a lot of fun. I am an assistant coach for John's team, so I have not had an opportunity to take pictures. But, I must brag. Last week he hit an "inside-the-park" homerun. Talk about excitement! Anyway, be sure to share what is going on in your life. Continue to keep us in your prayers. I just wanted to drop you a note to say that we would covet your prayers! I started my Fall Semester today and Lisa and the kids have been in full swing for several weeks. With school for the family, baseball practice/games for John Arthur, and Soccer practice/games for Anna, our family is in full swing. Here are the classes that I am taking this fall (if you are interested): Inductive Bible Study on the Psalms, Old Testament Exegesis on Wisdom Literature, Mentored Ministry (Contextual ministry class), Foundations of Youth Ministry Class, and Speech/Communication for the Pastor. With me working full time and the aforementioned schedule, your prayers are appreciated. Please let us know how we can pray for you! We would be happy to add you to our family prayer list. Email me or Lisa and tell us how you all are doing.